Digital Signage Expo (DSE) unveiled the independently judged winners of its Apex and Content Awards for 2011 at its 2nd Annual Awards Dinner, held February 24th, 2011, at the Paris Hotel in Las Vegas. At the Awards ceremony Gold, Silver, and Bronze Apex Awards were presented to winners in ten categories, from a field of almost 80 entrants. David Keene, executive editor of Digital Signage Magazine, was one of the judges for the APEX Awards/Best Digital Signage Venues. Winners of Apex Awards for 2011 are listed below, with details and highlights from selected winners and entrants. • Bronze – The Sony Centre for the Performing Arts with Sony of Canada Ltd. Winner, Gold Award, Arts, Entertainment, Recreation:EAV, Engenharia Audiovisual (the Integrator), and C-nario, with Firefox Com (reseller), for Brazil’s Sport Club Internacional. The installation is located at the museum of Brazil’s Sport Club Internacional, one of the country’s leading soccer teams. The museum is located at Inter’s stadium in Porto Alegre. Two large LED screens (400x200 cm) were added at the entrance to the museum. These function as a sort of TV news channel of Sport Club Internacional, showing team matches and other sports activities, training sessions, facts related to soccer, and more. A special section of the museum, called “Ser Gigante” (to be giant), includes three large front projector screens that present the club’s historic path, including major achievements. 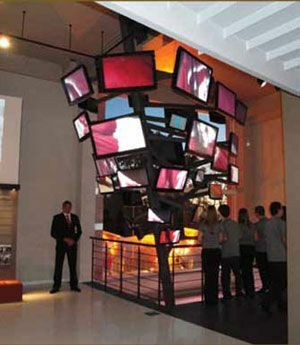 Another section, called “The Torch,” is a “video sculpture” that contains 36 TV screens displaying scenes from Inter’s matches, plus images that show teams, flags, and fans. Visitors have the feeling of actually being in the great moments of the club’s history. Winner, Silver Award, Education & Healthcare: Scala, for Texas State Technical College. This entry combines an educational program with an actual installation. This is the first time a college is pairing a graphic design degree with marketing strategy and applying it to the digital signage medium. Students will use Scala software to create content and manage playlists, as well as learn how to identify audiences and measure and track digital marketing results. At TSTC, students receive training in digital signage completely online in a virtual classroom environment called Second Life where students log in with an avatar. The program is a coordinated effort between TSTC and Western Texas College (WTC). The degree includes courses on digital content creation with animation using Adobe Photoshop and Adobe Flash, as well as other animation and video software. Students also learn system design and scheduling using wellknown industry products such as Scala Content Manager and Scala Player. • Silver – Squash Showdown with Aerva Inc.
• Bronze – Amway Center Arena with Harris Corp.
• Silver – Toscanini’s with LocaModa Inc.
• Bronze – Playmixes with Aerva Inc. Winner, Gold Award, Food & Beverage: Scala, and dealer Zero-In Media, for client 4Food. This digital signage installation complements one of the most dynamic cultures within quick service restaurants. With digital menu boards and a giant LED wall, the digital signage network integrates with the restaurant’s point of sales system and real-time inventory. Also, the network integrates with online community that 4Food has created where customers can build their burgers and sandwiches online and then pick up in store. If the customer so chooses, the experience can begin before even entering the restaurant. A customer can go to www.4food.com in advance or online and build their burger to pick up for purchase within the store. This can be done on a computer, or the customer can use 4Food’s smartphone application. Once the customer enters the store, a giant 13’ x 20’ LED wall displays digital art, streaming television along with all Twitter feeds directed at 4Food’s handle and any 4Square updates. When the order is ready to picked up and paid for, it flashes the person’s name or account name. Orders can also be taken at the register that sits under and digital menu board wall that is 5 screens across by 2 screens high. The digital menu boards are made up of 10 46’’ Samsung LCD screens. As of October 13th, 2010, over 7000 custom burgers have been created. Over 6000 online user profiles have been created. The system is averaging 2644 foursquare check-ins per day; 400 checks are a day are being displayed on the digital signs for ticket pick ups. • Silver – Vans with LocaModa Inc. Winner, Gold Award, Public Spaces:Bell Ice Cube with Scala & Jigsaw Interaction Design. Bell, one of Canada’s largest communications companies, wanted to provide the ultimate fan-zone experience with a dynamic, place-based media execution called the Bell Ice Cube. Housed in a 3000-square-foot temporary structure, the Bell Ice Cube allowed visitors to cheer and watch teams compete live in HD, get the inside scoop on their favorite athletes using interactive cubes or “Smart Cubes,” listen to live music, and mingle with some of the world’s best athletes, all under one roof. Scala Certified Partner Jigsaw Interaction edited video content and produced all of the motion graphic elements used on the cubes and around the Bell Ice Cube. diVA, Jigsaw’s custom software and hardware platform, was used to manage and assemble the entire interactive experience while working in tandem with Scala 5 via Jigsaw’s custom API. Scala 5 provided the reliable controllable HD media playback engine, and Scala 5 Network Manager provided valuable remote monitoring of the computer hardware and playback engine. Together, the two-way communication delivered the robust solution needed for all hardware and sensors to respond to the environment and user actions. The end result was a remotely monitored multi-dimensional user experience. Jigsaw also produced all the motion graphics and animation content that was used throughout the venue. Once inside visitors had the opportunity to engage with the space while constantly being entertained and delighted by visual and physical stimuli. The center of the room hosted 12 22” Samsung LCD screens or “Smart Cubes.” The cubes acted as self-contained interactive kiosks that responded to user’s simple hand hover actions letting them select between three HD videos. The cubes also responded to visitors’ movements throughout the space. The LED illuminated white cubes would switch to a glowing blue cycle when someone was within a certain distance of it, and then back to white as they moved away. Sensors ensured a 360-degree detection radius. The visual result produced the illusion that the cubes “followed” visitors through the space. When a user stood within 2 feet of the front of the cube, a special condition was met, the glowing cube would respond by turning to a solid blue. At the same time, onscreen content would switch from a screensaver type animation to a short 3-second visual animation. The animation showed the user where to hover their hand in order to select from a unique set of videos and where to plug in their ear buds. As the user walked away, the cube would return to its default state. Winner, Gold Award, Retail:Unified Brand, and Scala, for Camelback Toyota. Camelback Toyota, located in Phoenix, has moved into a new, state-of-the-art, 62,000 square-foot showroom alongside a 65,000 square-foot service facility. After a vendor search, Camelback Toyota contacted Phoenix-based Unified Brand to help with developing a digital signage network that would offer custom content and a high-end brand experience. Working closely with Scala, Unified Brand put the pedal to the metal to create a sophisticated digital signage network with an expansive fleet of flat-screen TVs and delivered all the customized content Camelback Toyota was seeking, including a “build your car” feature. • Bronze – Tallink Silja Ferries with ONELAN LTD. Winner, Gold Award, Transportation:Omnivex Corporation, for the City of Los Angeles, Destination Shuttle Services. DSS now provides hotel shuttle services for over 2.5 million people annually both to and from LAX and the surrounding hotels. The system aims to enhance the hospitality experience by providing passengers with relevant travel, hotel, and city information while on the buses and within the hotels. The goal of the system is to extend the hospitality guests are used to at the hotel all the way to the curb at the airport. Through the use of Omnivex GPSLink, DSS can provide their passengers with location-based content on the moving buses. Each bus has a Windows-based PC running Windows 7 and Omnivex software, as well as a GPS bud. Using Omnivex Moxie software and Microsoft Windows 7 location-based services, GPS coordinates sent via a 3G network to the server in real-time indicate the current location of the bus. This makes content relevant for the viewers. By linking the digital signage on the buses with interactive kiosks in the hotels, the whole journey becomes part of the hotel experience. • Gold – Intel End Cap Concept, nominated by Intel Corp.
• Silver – adidas Virtual Footwear Concept, nominated by Intel Corp. Judges for the DSE 2011 Content Awards were Justin Carll, senior producer, Moxie Interactive; Maria Kozlova, web & graphic designer/owner, MKgrafix. com; Richard Lebovitz, editorial director, Digital Signage Expo; Susie Sanders, digital media editor, Digital Signage Expo; and Daniel Wilkins, president, n2 Media.